An often-repeated take on the site this season has been that Cleveland isn’t that great of a team. While that may be true, they do have some special players. Their stars are good enough to beat you almost on their own. 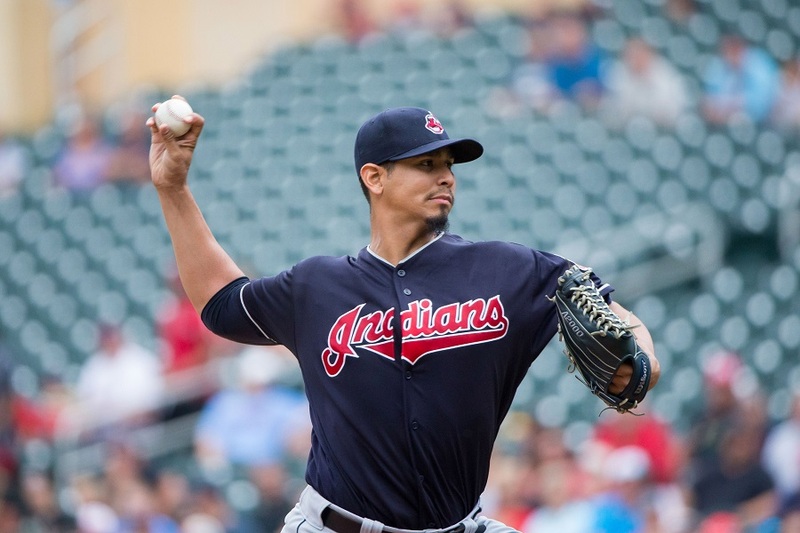 One day after Jose Ramirez showcased his skills with the bat, Carlos Carrasco dominated the Twins on the mound. He struck out 10 batters over 7 1/3 scoreless innings, holding the Twins to five hits in the process. Mike Berardino reported that new Twin Logan Forsythe was working on one hour of sleep. Sounds like a great choice as a pinch hitter in the highest-leverage situation of the game today, huh? With the Twins trailing 1-0 in the eighth, Robbie Grossman drew a 10-pitch walk to put runners at first and second with one out. Forsythe took two strikes, then hit the third pitch from Brad Hand 100.3 mph. Unfortunately, it was a bullet on the ground to Francisco Lindor, who started an inning-ending double play. The only real scoring chance the Twins had other than that inning was when Joe Mauer hit a two-out triple in the sixth. Cleveland’s first run came on a well-executed play on the bases. With runners at the corners and one out in the sixth, Ramirez broke for second. Mitch Garver fired down to get him out, thanks to an impressive tag by Ehire Adrianza, but Rajai Davis took off for home on the throw and beat the relay back to Garver. 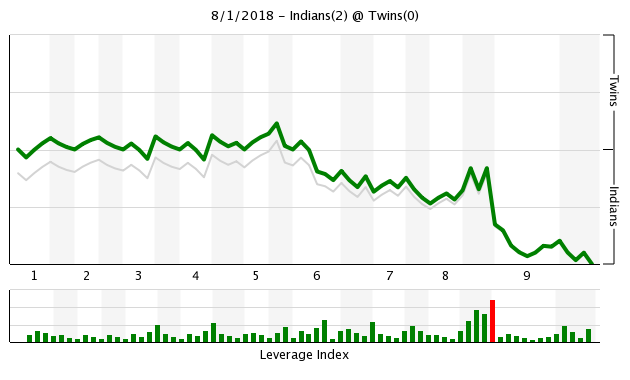 Cleveland’s second run came in large part due to an error on Jorge Polanco. MIN 5, CLE 4: Awesome Sauce! Watching Mejia makes the return for Lance Lynn just seem like free players. Too bad Mejia pitched 3 innings in relief the other day in Boston. Pulled in the 5th after 74 pitches - 1 hit, 3 walks up to that point. Hopefully on full rest before his next start we'll see him pitch into the 6th-7th-8th. Mejia will end up getting Cleveland 3 times in August, including today. Next two are in their house. Great opportunity to see how he fairs against the current rivals. Tough assignment. We are desperately looking for good things now.Mejia was good - no doubt.The batters were not.Shut out, shut down.Who is going to grab a bat and get something going?Bring up the kids - Glad to have Moya and Mejia, but there are a lot more that should be playing out the season with youthful excitement. And a bunch of old vets who should sit. Nice outing from Mejia, hopefully he can finish the season strong and solidify his spot on the roster for next season. I would be totally fine if he was next year's #5 starter. Keep batting the Black Hole 4th Paul.What do you think will happen with a guy hitting .190 in Aug?You got to get Joe,Rosario,Polanco,Kepler,Sano,Garver,together in some order, then Grossman,2bman,Cave. You've got no chance by spreading out the hits and the guys with high OBP. Let's just say weekday afternoons are road games for me. I'm definitely not saying I would ever write about the Twins at my day job. Nope, not me ... would never do it. Company man, am I. But it is more difficult for me to do certain things under these circumstances. I thought about plugging it in now, but they're off tomorrow anyway so I got working on a trade deadline roundup/ranking the new prospects/grading each deal article instead. Should have that up tonight. Meanwhile, Lynn gets through 4.1 innings in his Yankees debut with 71 pitches—5 hits, no runs, no walks, 5 Ks. And Tyler Austin hit his second HR in as many games at Rochester this evening. Meanwhile, Logan Morrison gets MLB at bats for no particular reason. Perhaps you could provide one for us. I generally agree, but I think they should keep Sano 6th or lower until at least Sept. Treat him like a rookie at this point, even if they didn't do that in his actual rookie year. Morrison should be passed thru waivers, and if there is zero interest just release him and call up Austin. Meanwhile, Dozier goes 3-4 with a homer and the Dodgers win in extras. Watching Mejia last season, and a couple times this year, always felt he could be anyway from a decent-solid SP at the back end to maybe as good as a #3. Biggest problem to learn is just how to finish guys off and economize his pitches. I also feel his stuff would play up well in the bullpen if the rotation just doesn't work out, or Gonsalves and/or Thorpe surpass him. (Which I could see happening). One way or another, he needs to remain up the rest of the season! Ok cool. Just askin. I hope that didnt come accross as being grumpy as i have been and am grumpy lately with the trades lately.